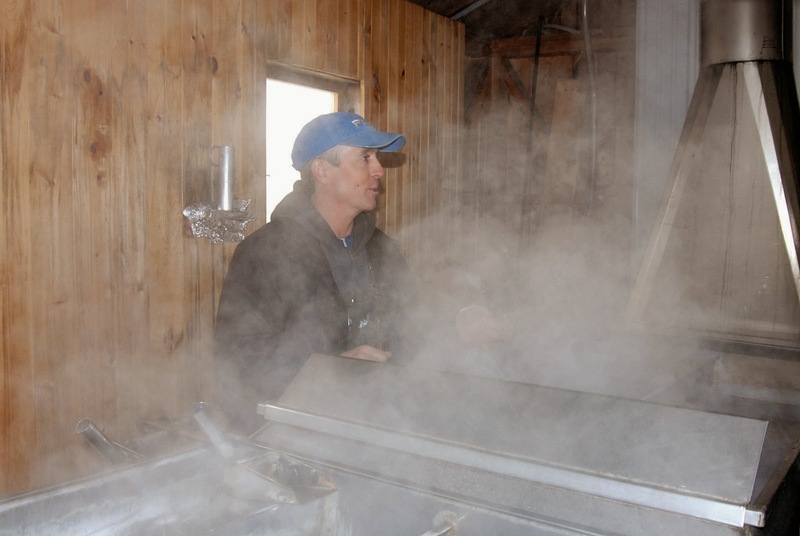 Mark Cooper, of Cooper’s Maple Products manned the sugar shack on Sunday while hundreds of people filtered past, stopping to ask questions and to look into the large vat of boiling sap. “We’re still very small,” Cooper said of his 1,800 tapped trees in the area. 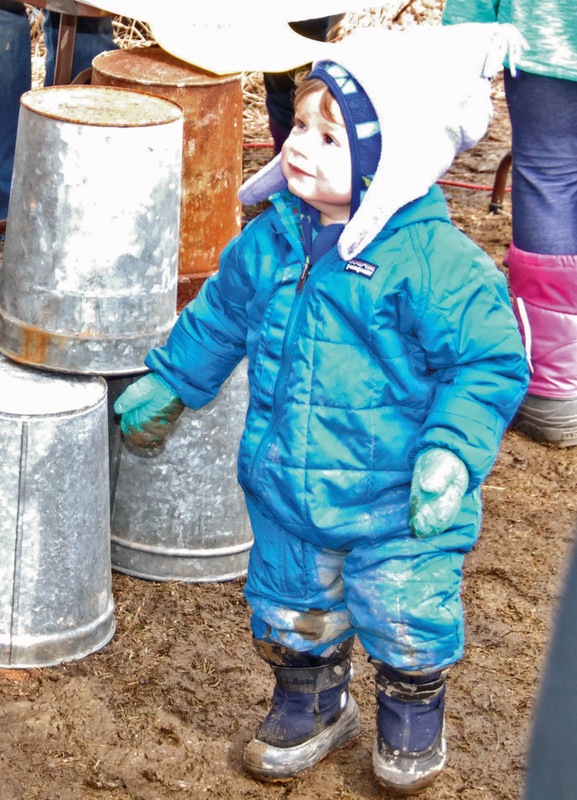 The lines were long and people were enjoying the day at Cooper’s Farm on Chute Road as well as other area farms in Windham, Raymond and Gorham. Balsam Ridge Farm in Raymond had a good weekend too. “”Everybody gets out there regardless of the weather to pretend that spring is here,” owner Sharon Lloy. “The crop is certainly down from what it normally is,” she said, but in the next 10 days the weather will change. “Rest up now. It’s going to be a sap-a-gedon. We’re going to be busy,” Lloy said. Balsam Ridge, which started with nine taps, has over 1,200 now. “It’s an addiction. It starts as a few, then a bit more and we continued to grow,” Lloy said. “We had 3,000 people last year and that was up considerably. Everybody had a huge crowd last year,” said Cooper. Each year the Cooper sugar shack makes a few hundred gallons of syrup on average every year. This year because it has been so cold the sap has not been running so Cooper expects an extended season, until April 17 anyway, which has been the latest he’s made syrup in the past. The season is six weeks long on average. “We all love making syrup. But there is a point where we want to be done,” Cooper said. 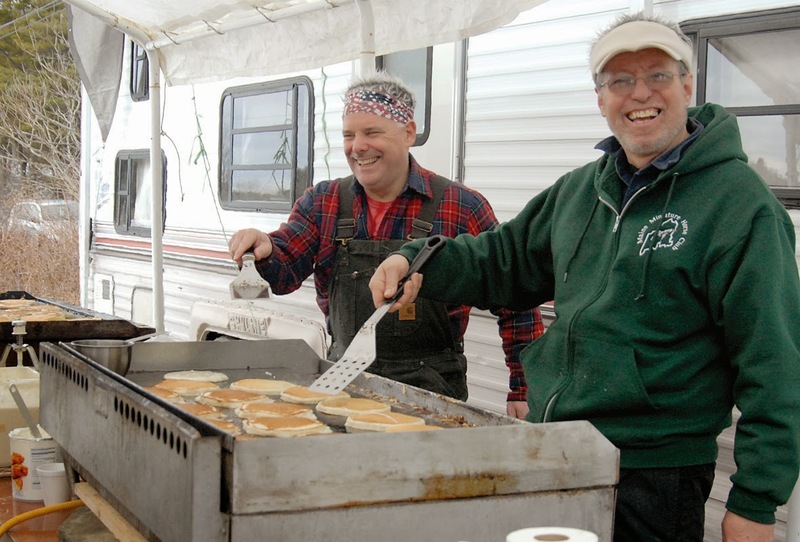 Maine Maple Sunday is in its 31st year with 94 sugar shacks on the register. Cooper’s has been a part of the festivities since the late 1980s when there were only 17 on the list with only three in Cumberland County, he said. Cooper’s had everything on sale from maple lollipops to maple cotton candy and of course, various sizes of maple syrup. Balsam Ridge in Raymond ran out of their baked beans made with their maple syrup and hot dogs steamed in sap. Merrifield Farm in Gorham had maple smoked cheeses, maple soft serve ice cream and maple butter. Many of the items are still on sale. 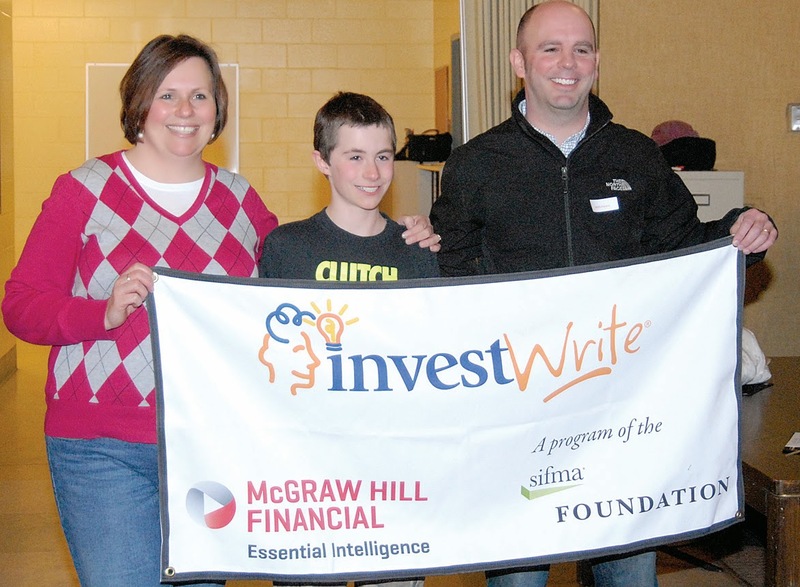 Sixth grader Anthony Gugliuzza from Windham Middle School sat in the front row of the music room listening to Elizabeth Reidel, the vice president of sifma Stock Market Game program, talk about the fall 2013 Maine State winner of the InvestWrite Competition who was sitting in the room. It wasn’t until Reidel mentioned the stocks the winner invested in that Gugliuzza knew he had won. In his essay, Gugliuzza was asked to identify something he would like to save for over a 10-year period and discuss what types of securities he would invest in to reach his goal. After thorough research, Gugliuzza had chosen NetFlix and Xylem, Inc., companies he believed were financially sound. Gugliuzza, the son of Kristen and AJ Gugliuzza, is a student athlete, on student council and involved with People to People Leadership Program in Washington D.C. Gugliuzza often takes it upon himself to make contributions to several charitable organizations. For winning he received a $100 gift certificate, a trophy which will be on display in the school’s trophy case and was invited to an award ceremony in Portland to be recognized again. Gugliuzza’s teacher Aaron Vachon has been doing the program for seven years. “It teaches students about financial literacy at the middle school level,” said Vachon. In the Stock Market Game the students are given $100,000 to start and they have 10 to 15 weeks to grow their investment. Gugliuzza’s essay began, “I am here today to outline for you my 10-year investment goal. My goal is to save enough money to pay off my college loans. In 10 years I will be 21 and in my senior year of college. When I get out of college I don’t want to have high student loans to pay off. I will have other expenses I will need to take care of such as living expenses, a car payment and many other “adult-like” expenses that may come my way. Although he won for his stock-savvy, Gugliuzza still wants to be a professional football player. The students work in groups during the Stock Market Game program but then write essays individually about their experience. Planning on reinvesting the dividends from his two stock choices, Apple and UPS, Greene feels he can accomplish this goal as both are steady stocks and react well to a stable economy. 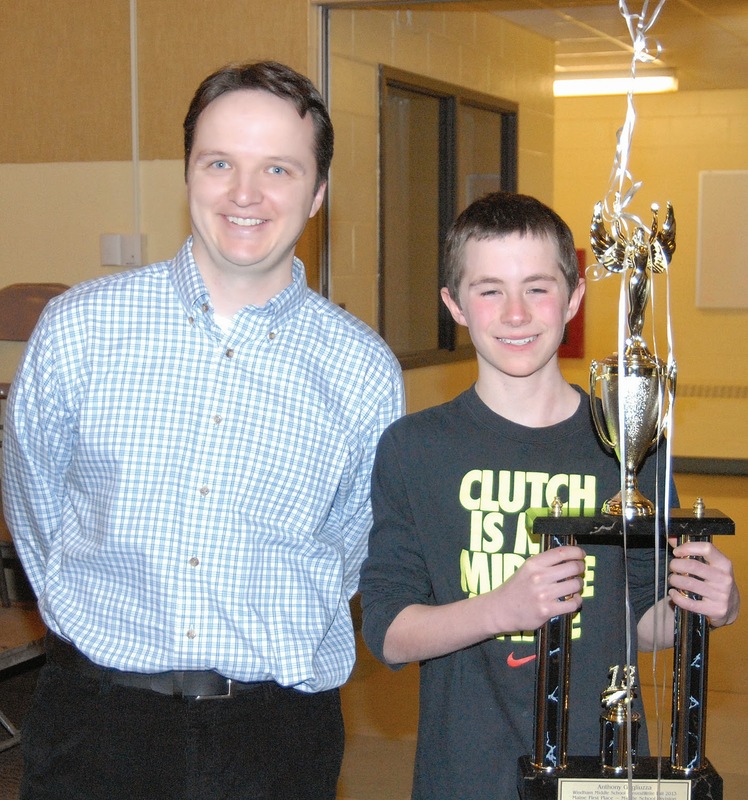 Greene and his teacher, Jack Fitch, will both receive a cash prize. Fitch, who has been teaching for 36 years, enjoys participating in the Stock Market Game with his classes and is proud to have an InvestWrite winner for the second year in a row. Alex Doering, a 2010 Windham High graduate, has planned a symposium in Brunswick called “Rethinking End-of-Life Care: A Weekend Symposium” after he became interested in Hospice and medicine that helps people at the end of their lives. The 21-year-old Bowdoin senior has organized the program which will take place this weekend, March 28 and 29. He hopes to do oncology research in a laboratory in the Boston area. Doering’s mentor, Suzana Makowski, the co-chief of the Palliaive Medicine Division at UMass Memorial Hospital, helped with the idea of the symposium. With Makowski and the help of Margaret Zillioux, who works as a Hospice volunteer services coordinator at CHANS Hospice, Doering gathered speakers who could present on different end-of-life issues with a liberal arts perspective. Doering has been working with Hospice since his second semester his junior year. He also created a Hospice volunteer club on campus for others who were interested in volunteering and the Hospice training which is 30 hours long. Doering is interested in working in the field of oncology and palliative medicine, which is pain-treatment medicine. He would eventually like to be a Hospice medical director. In middle school, Doering knew he wanted to do something with diseases, but after taking Mr. Hanaburgh’s biology class at WHS, he knew from a video on angiogenesis (cancer) that he wanted to work in the cancer field. The symposium begins at 2 p.m. on Friday in the Bowdoin Visual Arts Center and begins on Saturday at noon in the same building in the Beam classroom. “I encourage people to step a little outside their comfort zone and come,” Doering said. For more information on the symposium visit Rethinking End-of-Life Care: A Weekend Symposium on Facebook. Saturday, March 22, the newly renovated Cumberland County Civic Center (CCCC) will open its doors for a public open house from 10 a.m. to 2 p.m. There will be three bands, refreshments, giveaways and tours of the new facility including some backstage areas that general admission tickets never see. The renovations completed by Cianbro and WBRC Architects were paid for with a $33 million bond. The construction moved the exterior of the civic center to the edge of the property line, Wright said. It also brought all of the stairs leading to the civic center under cover. “We are no longer shoveling mounds of snow and acres of stairs,” she added. The entire building is also Americans with Disabilities Act (ADA) compatible in all areas of the CCCC. Elevators can take a person on a stretcher from the upper level to the floor of the civic center. All public areas are accessible to people in a wheelchair. The former platforms leading to upper seating areas are now bigger and have seating for 72 handicapped ticket holders and guests, some at ice level. There are 90 TVs throughout the building installed by David Munster of Windham. He also donated a plasma TV to give away at the open house. The Free Street concourse did not change much, Wright said. It was painted to match the entire civic center. At the beginning of that concourse a grill was added that will serve hamburgers, steak and cheese and pulled chicken sandwiches. The first of two family restrooms is located near this section of the civic center. There are other new bathrooms located throughout the CCCC as well. The Spring Street concourse was expanded by four feet. There is also a new window to sell Maine microbrews and the CCCC is now a Dunkin Donuts franchisee. New additions to the facility included suites added on two of the corners of the building, stacked three high. The first one is owned by The Libra Foundation, the first founding partner for the CCCC. The suite will be donated by The Libra Foundation to non-profit organizations for their entertainment. It will not be used for fundraising, said Wright. Each suite has a private bathroom and will have a personal attendant for snacks and drinks at the events. The other change is the amount of natural lighting that streams into the public spaces. “It was a smart design choice,” said Wright. The lighting has been switched to LEDs. She also pointed out the wood trim around the soffits of the civic center, which were added by Windham Millwork, who did all of the woodwork in the suites, railings, tables, back offices and ticket counters. “Anything wood or plastic laminate we did there,” said a representative of the Windham company. The CCCC also wanted to maximize saleable seats, since the remodel did not include a large increase in the number of seats. The operation booth was moved over to give better seating in the center of the arena. The almost 8,400 new seats are from Hussey Seating Company of North Berwick, the same company that put the original seats in in 1977. There are three different sized seats to fit the differently configured rows. There are two new recaptured spaces that will be used for private dining and gatherings. One is the Club Room which replaced the Captain’s Club. It’s a premium seating option. There are ways to be a part of the civic center by buying seats that help to directly pay off the bond on the building. 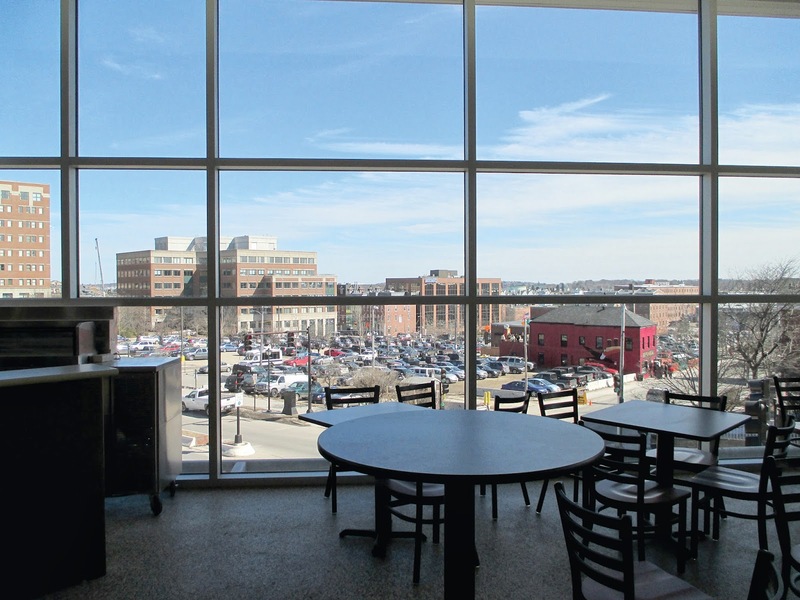 There is also the addition of The Pavilion, a food and beverage lounge, above the Spring Street stairs and the CCCC’s first escalator. “There will be partitions for providing privacy. Here we’ll feed (the entertainers) a couple of lobsters and they’ll remember Portland, Maine,” said Wright. The bathroom in this area of CCCC has more fixtures than in the entire building before the renovation. The renovation has directly addressed the issues brought to the CCCC by people who have used the arena, including the addition of two new loading docks. Other additions include a new fire suppression system and upgrades to all of the mechanical systems. “This is where a significant amount of the money went,” said Wright. Seats were removed from where the concert stage is usually placed thus making the stage sit further back and opening up more concert seating, however they added telescopic seating to increase seating at other events. New flooring was put down on the concourses. In the backstage areas there are new suites and seven locker rooms. The new Portland Pirates locker room, still under construction, will be a large multi-use area for the team. There is also a new first aid room with attached bathroom and direct access to the outside where an ambulance would have access. The CCCC employs 11 full-time and 409 part-time staff.